7. St. Patrick’s Church is an early nineteenth-century church built in the Gothic-revival style. 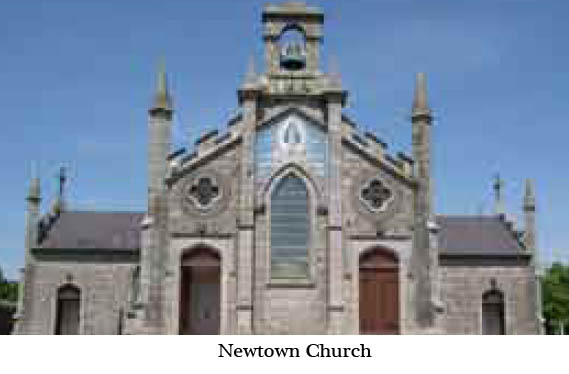 It has been described as a reduced version of Cobden’s Carlow Cathedral and is regarded as one of the finest Gothic barn-type churches in Ireland. 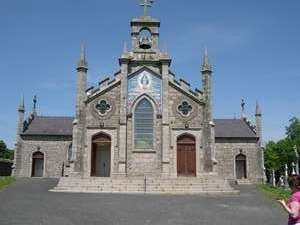 The granite-built church dates from c. 1830 and has a T plan. The attractive, three-bay exterior has a large central window flanked by quatre-foil windows over doorcases. In the centre of the façade is a mosaic of the Blessed Virgin, dated 1954, celebrating the Marian year. Above this is a bellcote which in turn is surmounted by a cross. The bell dates from 1900 and was cast by a Dublin foundry. 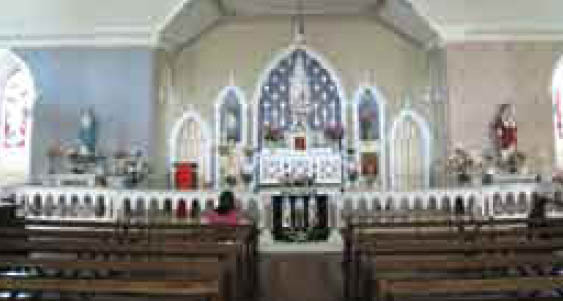 The interior has retained its three galleries and simple Gothic reredos . 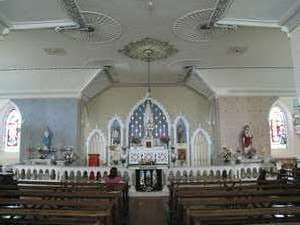 The decorative plasterwork on the ceiling is particularly eye-catching and is believed to be the work of Italian refugee artisans who were working locally in Fenagh House at the time the church was being built. The decoration features the motif of the grape and the grain. The stained glass windows are by Joshua Clarke who was the father of Ireland’s most famous stained glass artist, Harry Clarke. His vibrant piece depicting St. Patrick, the church’s patron, is of significant artistic merit. 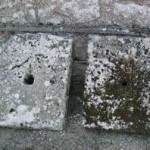 In the graveyard behind the church can be seen two granite slabs with circular apertures. 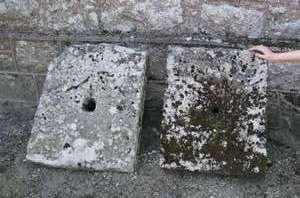 These are believed to have come from a watch-house located in the cemetery to deter corpse stealing for medical research or financial gain. Quatre-foil: Open-work design or ornament divided into four lobes. Reredos: A screen or panel behind an altar.